I got up earlier than usual this morning to swim with South Davis Masters. 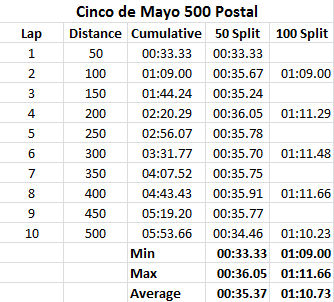 Today was the second day of a postal event that they are hosting called the Cinco de Mayo 500 Postal. The idea is to swim a 500 as fast as possible, with a special award given to anyone who can do it by descending their time each 50. After a quick warm-up, we got ready to swim the 500. There were quite a few swimmers and we had to split up into three heats so that everyone could swim with a timer and counter. I counted for two people and swam in the last heat. I wasn't expecting a great time, I just wanted to be part of the event. My first 100 felt pretty fast and I was a little worried that I was going to bonk before I was done. I felt better than I expected the whole 500 and my elbow (which I messed up at the last meet) didn't bother me at all. I was surprised when I finished at 5:53.66 (with a wall start!). 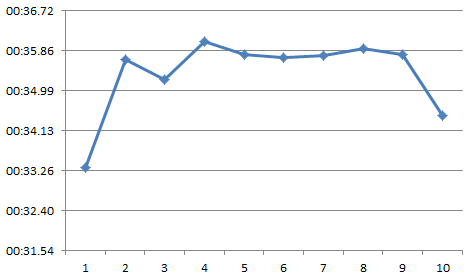 That was just a bit faster than my 500 time at the QUAC meet (5:56.72). With a proper start from the block, I probably could have been closer to 5:50. This was a fun event, and only cost $5 to enter! For anyone who wants to give it a shot, I'd be happy to be your timer. Entries have to be received by May 6th. Click here for event details.